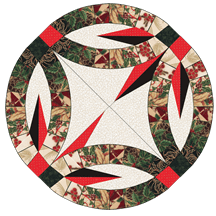 This design is for a Table or Bed Runner only and Includes sizes from 20" X 20" to 30" X 120". Click here If you are looking for a full size quilt. If you have already purchased the Wedding Star and would like to purchase only the additional layouts - Click here.